Dave Grohl loves a good side project. From Probot and Nine Inch Nails to Them Crooked Vultures and Slash via Queens Of The Stone Age and Tenacious D.
But, he's told Music Week that collaboration after collaboration only makes his love for the Foos stronger. 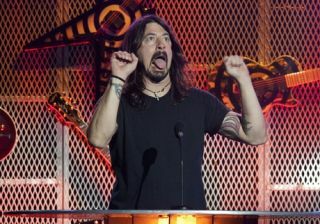 Grohl said: "I can't ever let the Foo Fighters go. I can't not be in this band. "Whenever I go to do a side-project it usually re-energises me to come back and do this. Whether it's doing Vultures or jamming with Paul McCartney, it always makes me want to come back to the Foo Fighters." For more on the Foos look out for next month's Rhythm (on sale 10 May) for a huge Taylor Hawkins cover feature.